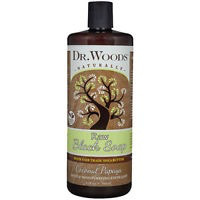 Dr. Woods Coconut Papaya Black Soap’s aromatic fragrance sends your senses to a tropical paradise, while leaving your skin smooth, hydrated and healthy. Our unique formula is a gentle exfoliant and a powerful, deep cleanser that rejuvenates the skin without any need for harsh detergents or toxic additives. Made from plantain skins, palm kernel oil and shea butter, Black Soap is an abundant source of skin-nourishing nutrients A, E and iron in a unique formulation that provides a luxuriously rich and gentle all-purpose cleanser for your face and body. Purified Water (Aqua), Saponified Coconut, Hemp and Olive Oils (with retained Glycerin), Pure Black Soap, Organic Shea Butter (Butyrospermum Parkii)*, Coconut Papaya Fragrance, Tocopherol (Vitamin E), Sea Salt, Citric Acid, Panthenol (Pro Vitamin B5), Rosemary (Rosemarinus Officinalis) Extract, Natural Caramel. *Certified Organic by Ecocert S.A.